M. Night Shyamalan's career has been a polarizing one. From his quiet start with 1992's Praying with Anger & 1998's Wide Awake, which are vastly different from the films we associate with him, & his most successful period with 1999's The Sixth Sense, 2000's Unbreakable, & 2002's Signs, to his less successful period with 2004's The Village, 2006's Lady in the Water, 2008's The Happening, 2010's The Last Airbender, & 2013's After Earth, & his rebirth with 2015's The Visit & 2017's Split, his career has been received at the extreme opposites of the spectrum. I have only seen Unbreakable & Split, which I both enjoyed. 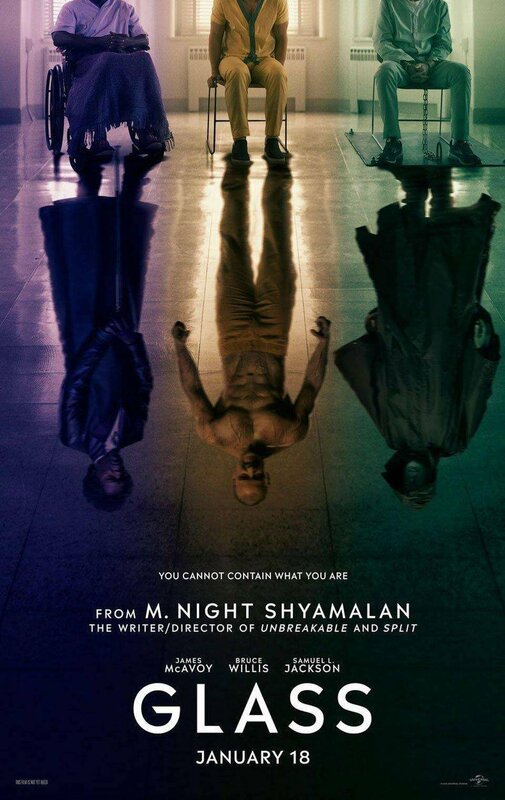 Glass is the only film by M. Night Shyamalan that I have not liked. The third installment in the Eastrail 177 Trilogy, the film follows David Dunn (played by Bruce Willis), a former security guard in Philadelphia with superhuman abilities & the ability to sense other people's crimes by touching them. Dubbed "The Overseer" by people on social media, & with his son Joseph (played by Spencer Treat Clark) working behind-the-scenes, David fights crime as a vigilante. One day, David encounters Kevin Wendell Crumb (played by James McAvoy), a former employee at the Philadelphia Zoo who has dissociative identity disorder, with 23 different personalities, which combine to create a 24th personality named "The Beast." 3 weeks earlier, Kevin, under the control of his personalities, kidnapped 3 girls, killing 2 of them, & then letting Casey Cooke (played by Anya Taylor-Joy) go free. Kevin, dubbed as "The Horde", is sensed by David as the person who has kidnapped 4 cheerleaders. David goes & finds them, but soon after, David & Kevin end up getting into a huge fight, & are soon arrested & taken to a mental institution. At the mental institution, they soon meet someone who was once involved with David: Elijah Price, AKA Mr. Glass (played by Samuel L. Jackson), who has osteogenesis imperfecta & once manipulated many disasters to find David some years prior. Dr. Ellie Staple (played by Sarah Paulson), the head doctor of the institution, has 3 days to convince all 3 of them that they do not have superpowers & only have delusions of power. Joseph, Casey, & Elijah's mother Mrs. Price (played by Charlayne Woodard) try to vouch for them, but to no avail. While in the mental institution, & through some manipulation, Elijah & Kevin meet, & once assured of the existence of "The Beast," Elijah decides to team up with Kevin to show that superhumans exist. Now it is up to David to stop them. The cast is excellent. Bruce Willis shows that he still has some acting talent left in him, as he has not shown that since Moonrise Kingdom. James McAvoy shows once again that he can play villains incredibly well. Samuel L. Jackson is great, as always. And the rest of the cast, especially Taylor-Joy & Paulson, is excellent as well. M. Night Shyamalan's direction is great. Although Shyamalan goes a bit off-course near the end, he does have a lot of ambition, along with a very grounded realization of superheroes. And M. Night Shyamalan's screenplay is a mess. The dialogue is very well-written, & the first act is intriguing, but the second & third acts are not well-plotted, & the twist is awful. This is a disappointment. Although certain aspects are very well-done, others are not, making this a very ambivalent end to the trilogy. Glass was seen by me at the MJR Marketplace Digital Cinema 20 in Sterling Heights, MI on Saturday, January 19, 2018. It is in theaters everywhere. Its runtime is 129 minutes, & it is rated PG-13 for violence including some bloody images, thematic elements, & language.